Water trees, shrubs, flowers and landscaping in tourist towns in northern Ontario. Provide dust control on construction sites. Muskoka, Ontario is a popular tourist destination located about two hours north from the bustling metropolis of Toronto. This seasonal destination features pristine lakes, forests, rolling hills and more. The District municipality consists of the Town of Bracebridge, Georgian Bay, Gravenhurst, Huntsville, Lake of Bays and Muskoka Bays. This encompasses a wide geographical area which is a challenge for any municipal government to maintain infrastructure and other public spaces. The District towns of Muskoka required a higher volume water trailer as a source for watering trees, new landscaping as well as dust control on rural roads. The water trailer travels between Georgian Bay and Bracebridge on public roads, so the municipality insisted on the latest in stability control for safety and heavy duty components for daily use. 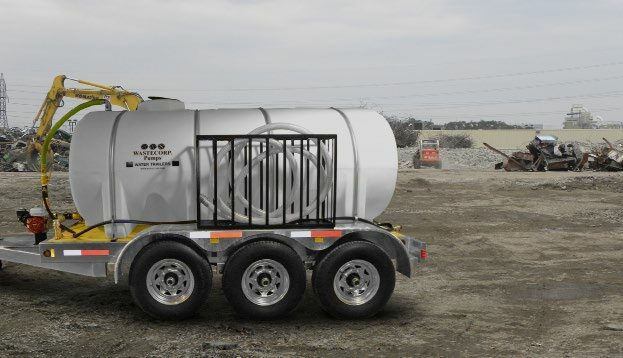 Wastecorp recommended, designed and manufactured our Wastecorp WT-1600 Series water wagon which includes a severe duty triple axle stability system and electric brakes. We included a DOT lighting system for full provincial compliance to haul on roads. The unit includes a high pressure water delivery pump with a 3.5 hp Honda gas engine. For watering delicate flowers, trees and shrubs. Wastecorp included a valve system to control water flow and an industrial grade rubber hose for watering trees. To meet the specification for watering rural roads, Wastecorp included rear sprayers and side sprayers to efficiently distribute water on gravel roads. We also designed a hose bin mounted on the fender to store all hoses and accessories. The best part is, the municipality received their water trailer in less than one month. Professional water trailers, quality, experience, and unbeatable delivery times - that’s a Water Hog Water Trailer. Municipalities across North America are adding water trailers to their public works fleets as a cost effective fresh water delivery method for maintaining public spaces like parks, rural roads and beautification projects.